*See Events page for special events happening this Christmas season. In celebration of our 10th Anniversary, we encourage visitors to bring a copy of their photo taken with Santa at the old Gaston Mall in his special chair to be placed on our Memory Tree as we begin a new Christmas tradition on the farm. As I have taken inventory of our Choose and Cut trees, please be aware that we have a limited, small number of Leyland Cypress and Eastern Red Cedar trees to be chosen for cutting. Most of these trees are larger ones. We do not want you to be disappointed regarding our Choose and Cut options. Years of summer droughts are the reason for the low number of Choose and Cut trees this year. We will have a large supply of precut Fraser firs from 5'-11'. After Thanksgiving weekend, we will receive another supply of Fraser firs PLUS Colorado Blue Spruce and Norway Spruce to offer our customers many choices. Plus, we keep our precut trees in the tree field in the shade and hydrated to preserve their freshness for you. All our other actives will be available per our schedule. Please enjoy your time on our farm. We want your visit to be a special time with you and your family! Thank you. The first "F" is faith. Christmas is a season of faith. "For unto us a child is born." The foundation of this season is our faith. Please use Christmas as a time to examine your faith. If only seeing the smiles of Christmas joy, the warmth of Christmas carols, the joining of family hearts, and the decorating of the tree...if only through these things, we can help you hold on to faith, we have accomplished the first "F."
The second "F" is for family. We want you to come as you are...you or you and your loved one(s). Walk together, be together, choose that wreath or tree together, let the little ones run together through the trees, and let time be no more for just a little while longer. This is the second "F." Let us for this season be a part of your family. Our last "F" is farm. This is the platform the Lord has graciously blessed us with so you may see faith and family clearer and sweeter. Our toils and labors on the farm are not about how much we can make or how much you can spend. It's to create a time that you can rest for just a little and create memories and traditions. We strive to make this place, our family farm, a little piece of heaven for each of you. May the Lord bless each of you this Christmas season! We love you all!! And look forward to seeing you THIS Christmas season. 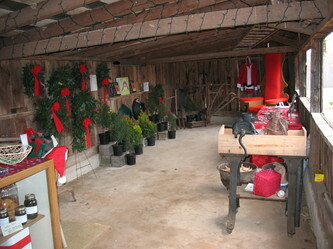 Use the contact form below to email Stowe Dairy Christmas Tree Farm directly. 2016 ENCCTGA © All Rights Reserved.